W. P. JAMES, B.A. 1855-1935. Mr. W. P. James died on 11th May, 1935, at the age of 80. He was the son of Mr. William Parry James, Architect, of Cardiff, and was educated at Uppingham and went on to University College, Oxford, where he took classical honours and was called to the Bar in 1881. Later in 1892 he was appointed High Bailiff to Cardiff County Court, much apparently to the sorrow of his many friends in London, one of whom, Gosse, described his new post as "a horrid useful job in South Wales." His chief interests were in Music and Literature, and in the latter he is well remembered for his two books "Romantic Professions" and "The Lure of the Map." He was also an active Churchman. He joined the Society in 1892 and was a regular attendant at the meetings. His election as President for the 1932-1933 Session was in the nature of an innovation as he had not served on the Council; it was a very happy choice, as he filled the office with great charm and dignity. It fell to his lot to preside at the first Biennial Dinner of the Society, and the ability and humour with which he did so went far to establish the permanence of this gathering. His death was a great loss to the Society and was lamented throughout South Wales. The interrelationships of early members and the fact that people felt this was an organization worth brining family into his easily shown here as this W. P. James is noted as being the son of the Architect W. P. James who had been at various times partner to Peter Price and 12th President and Edwin Seward 21st President. it is also worth noting the first of those was founder of the Free Library and the second was the Architect who designed the wonderful building in the Hayes in Cardiff. in many ways it is not surprising that the son of a man so involved would become interested in the literary world as noted above. Clearly he had the background of a naturalist as he commented in his book "The Lure of the Map"
On the old question, "what author one would take to a desert island". As a literary journalist myself I had had occasion to consider the question, and had come to the conclusion that I should myself choose an Atlas. It is wonderful what entertainment there is to be got out of an Atlas, with some experience of travel and a little imagination. You can plan tours that are often as vivid as the real thing and more satisfactory. With a large-scale map and a smattering of geology you can actually picture the scenery. 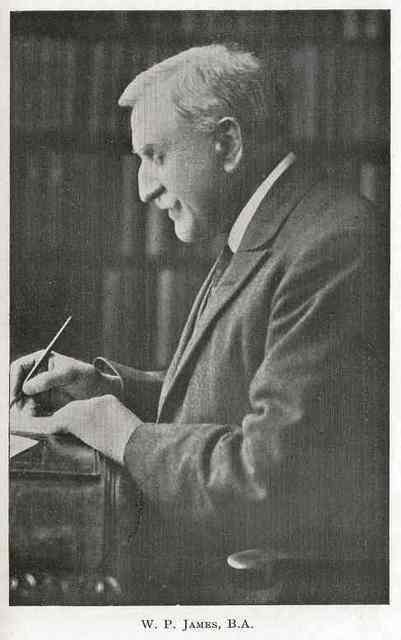 Mr. W. P. James, the High Bailiff of the Cardiff County Court, in the intervals of business, acts as literary " tea taster," if we may use the expression, for the St. James's Gazette, and the airy and familiar way in which he sometimes passes judgment in his weekly column of Chit-Chat on the writings of the great men of the earth, provokes much merriment among those of us who know Mr. James's limitations. And Mr. James, we would remind the reader, sometimes condescends to pass judgment on other things than the writings of men and women. The other day, for example, he took upon himself, in his lofty serene way, to sneer at "the self-constituted champions of Celticism " (namely, we presume, the Welsh-speaking Celts of Cardiff) who "vapour foolishly and loosely about the Celtic note," and with his usual self-assurance, seasoned with; more than the usual measure of priggish impertinence, he advised them to attend the lecture of Prof. Kuno Meyer at the University College London, on "The Study of Celtic Languages and Literature." We would respectfully inform Mr. James that we shall be prepared to listen patiently to him when he shall have taken the trouble to learn his native language, and shall have divested himself of the airs of the superior person. We shall continue to read his weekly contributions to the Gazette, for though his English lacks distinction, it is easy and fluent, and if his knowledge of modern English and French literature is not very profound, it is sufficiently wide and varied for his purpose, and for our entertainment.